Michael McCrudden was adamant he was joining Derry City before season started. STRIKER Michael McCrudden felt ‘annoyed’ that Institute issued a statement claiming he was staying for the rest of the season despite allowing Aaron Harkin join Cliftonville in January. 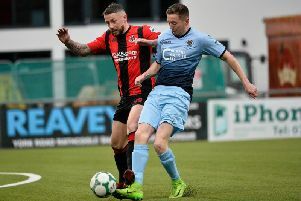 The 27-year-old was adamant he wanted to link-up with Declan Devine’s side before the League of Ireland season kicked off and didn’t want to join at the midway stage of the campaign. “Not once did I say that I was 100 percent staying with Institute, so the statement that came out did annoy me a bit,” he insisted. “But I could see their point of view that they had made a stance and they weren’t selling me. The ex-’Stute captain, who scored 19 goals and won two Player of the Month awards this season, said forcing a move to Derry City was the first time he was selfish in his professional career. McCrudden felt his three previous moves in his career, which all happened halfway through the season, meant he didn’t fulfil his potential. So for the first time in my career I was being selfish. It was the most selfish thing I have done in my career and I told Institute that, but hopefully they’ll have no hard feelings. “The reason why I wanted to go now was because I have moved three times in my senior career and it was half-way through the season and the thing I was most reluctant to do was to go to Derry in July and half way through the season and maybe it didn’t happen for me, but now I have got no excuses,” he stated. “Those previous three times I moved I went from Newcastle United to Derry halfway through the season, then I went from Derry to Institute halfway through their season and then Ballinamallard to Institute halfway through the season and all three times I have had nightmares. “So for the first time in my career I was being selfish.